Same great Index Maker® product now made entirely from recycled materials. Customize your own tabs and create dividers that look professional. 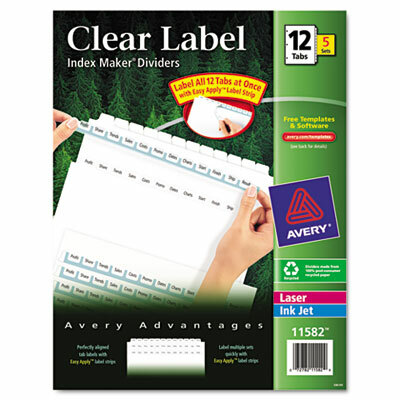 Clear labels virtually disappear when applied to premium white dividers. Label all the tabs at once and save time using the Easy Apply™ label strips. Same great Index Maker® product now made entirely from recycled materials. Customize your own tabs and create dividers that look professional. Clear labels virtually disappear when applied to premium white dividers. Label all the tabs at once and save time using the Easy Apply™ label strips. Great for larger projects requiring more than one divider set.